AN ACCUSED jewellery heist mastermind asked about an expensive gold chain during a visit to his alleged target the day before it was robbed, a court has heard. Andrew Simon Bell, 47, has pleaded not guilty in Maroochydore District Court to planning a robbery of Nambour Jewellers on March 26, 2015. Bell has accepted he was in possession of the majority of the gold chains taken from the Lowe St store when police raided his Montville home the day after the robbery. He has pleaded guilty to receiving tainted property, but denies having involvement in the actual robbery. Crown prosecutor Rebecca Marks said Bell had planned for two other men to commit the robbery. Ms Marks said Bell planned that the men would steal a car to be used in the robbery and planned the men would wear disguises. She said Bell had specific jewellery in mind for them to steal and went with one of the robbers to the store the day before the heist. The jury heard one of the men who committed the robbery would detail Bell's involvement. Ms Marks said the jewellery taken when a man ran from the store with four display cases and a mannequin bust was valued about $20,000 for wholesale and about $60,000 for retail. She said Bell later forced one of the robbers to sign a statutory declaration saying Bell had no involvement. "He did so by threatening him both verbally and physically," Ms Marks said. 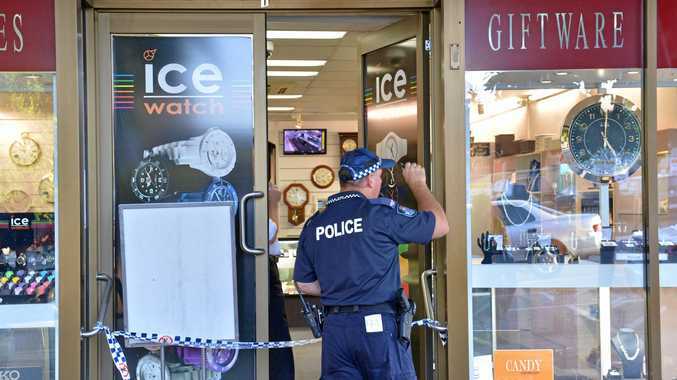 Nambour Jewellers owner Keira Fiorenza appeared as a witness, having been in the store the day before and the day of the robbery. She told how she saw a man with a stocking on his face come running towards the front door before she ushered sales assistant Brodie Eves to the safety of a locked bathroom. CCTV footage of two men in the store the day before the robbery and footage of the actual robbery was played to the jury. Bell will have an opportunity to give and call evidence as the trial progresses this week.